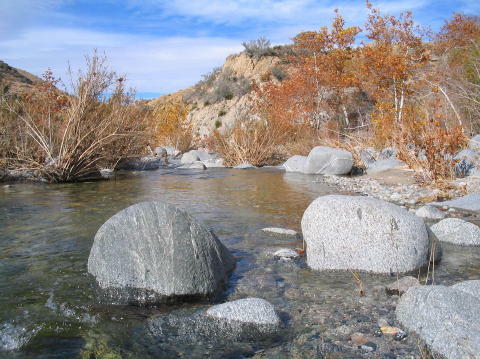 After discovering that Sespe Creek was out due to closure of the section we wanted to fish, Gary and I came up with a plan to fish Littlerock Creek, on the north slope of the San Gabriels near Mt Waterman. Gary had a friend who had backpacked into the area several years prior, and had reported catching and seeing "big fish". We were both skeptical, but since the creek eventually flowed into Littlerock Reservoir, we figured that we had a shot at catching something. Upon further investigation, it seems that the DFG had even stocked the creek itself. Details were sketchy, but Gary has an intimate knowledge of the area, and since the rains, I figured the water level would be adequate. 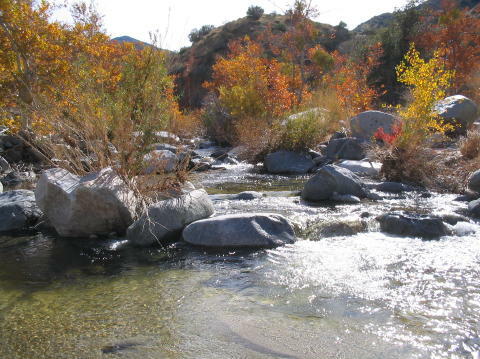 We would use our mountain bikes to access the stream about 5 miles below Angeles Crest Highway. We arrived at the trailhead at about 10:30, geared up and headed down the road from the end of the auto access. Past the old Pinyon Pines shooting area, and descending into the canyon, with the desert in the distance. We rode about 20 minutes, down 4.8 miles (and about 1200 ft) to the confluence of the South Fork and main stem of Littlerock Creek. The water was crystal clear, much clearer than I had expected. As we stood on a cliff 15 ft above the South Fork, I scanned the pool at our feet for signs of wild trout. Sure enough, after about 5 minutes, I spotted a nice fish, about 9", happily sipping something off the surface. We were pumped to see that there were indeed fish in the creek. Gary headed of to a promising pool and began fishing. I headed off to the spot where I had seen the feeding trout, to see if I could coax a rise. The fish I was after was tucked in nex to the bank, and I was able to drift a few casts right over him, but he was not interestd. I headed downstream, and caught up with Gary, who had managed to get a fish of about 8-9" on a Caddis. We continued on downstream, fishing the pockets and riffles, without any more success. I hopped across the stream and hit a particularly inviting stretch, but again came up empty. I then climbed atop a large boulder, and flipped a BH Bird's Nest into a nice slot between boulders. Fish On! Neat post Matt! Per my research, you were fishing in a "hot" zone - meaning possibly illegally. See materials sent via email. http://www.fs.fed.us/r5/angele...shtml. *Note that although it cites an end date in 2003 of the closure terms, these have been extended per a recent call that I put in to the Mohave Ranger District. and per this one (the money shot): http://policy.fws.gov/library/66fr9413.html. Also, if you look hard, you will find that the headwaters have had some electroshocking due to the discovery of Mountain Frogs (as mentioned earlier in this thread). So, in other words, LRC is being "dealt with" for two types of amphibians - a Toad and a Frog with the Toad being the most known matter. On a whole other note - Some of the access points along the crest were closed recently (Summer 2004) due to hostile bear activity. I think the DFG has been negligent in mentioning the restrictions in the regs booklet. Places like Deep Creek are, in fact, on the Endangered Species Act's radar with respect to the Arroyo Toad which sure gets me nervous. Hats off to you Matt for making that crazy trek! B - back in town. I grew up fishing a fork of Littlerock Creek that runs to the east of the road that follows the main part of the creek. This fork had to be hiked to, therefore in those days was pristine. It was also full of fish, rainbows and browns, I suppose planters gone wild, anyway I know they were breeding up there. Sometime in the 90's I think the entire area was blocked from the public, because of concerns for the arroyo toad. To my knowledge it never has been re-opened. Just wondering if anyone has knowledge of the current situation there. I lived in Palmdale, Lancaster, and the surrounding area from 1972 to 2001. For a couple of years I lived in Pearblossom and was fortunate enough to then to be about 7 minutes from BIG Rock Creek. I would fish it up to Devil's Punch Bowl. Yes, even that little trickle had a native population back then, including Goldens, cuts, and brooks. Below St. Andrews Priory one evening, I tied into a Brown that was all of 20 inches. You all know the story...1 1/2 pound tippet, the trout came up out of an oak root and right back in, no room to maneuver, #18 green mosquito...I never had a chance really...But even that was enough, I'm surprised my heart didn't explode it was pounding so hard. 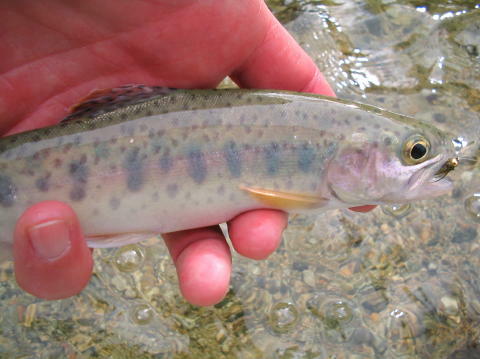 I have caught and released literally THOUSANDS of trout from both streams. A lot of stockers of course, but do we REALLY care? I taught myself how to fly fish On Little Rock. Heck, in the mid 70's I caught native Rainbows as far North as Avenue T on the out skirts of the town of Littlerock, and to Pearblossom Highway even as late as the mid 90's. I would get on Little Rock just South of the first campground after the reservoir and hike up 4 or 5 miles, fishing so late the bats would occasionally strike my fly in flight. As Mojaveman was saying, they did close it down, at least all the campgrounds. In the 80's it was "discovered" by the denizens of "Down Below"(LA) and 4 wheeling became very big, and they did a LOT of damage to the area. But at least until 2001, they never really "closed" it. They closed most of the campgrounds, most of the areas folks parked, and generally made off road access very limited to give the area a chance to recover early in the 90's. It was restricted heavily, but there was still great fishing if you really wanted it. It was also open all year 5/day-10/possession. You just had to hike a little more. I actually got my best results mid summer after stretches of the creek went underground, late in the evening. At all times, my best producer was a #20 green mosquito, then a cheap K-mart #14 elk hair caddis. Also had some luck with "tightly" tied Adams in #14 through #18. With all the fish I caught I probably lost an equal number of flies to the trees and underbrush. All of these worked year round, even with the occasional snow on the ground. Sadly it's been stolen since, but the rod I used the most was a three piece split bamboo, 9'6", that was my great grandfathers. So turn of the century or earlier:o( No idea the maker or the weight. There was no internet back then. I usually used 6 weight floating with either level or dual taper. To me, under those conditions, it really doesn't make a difference to the fish. Most of either creek is not easy fishing. But then, if I think it might hold a fish, that's where I'm going. It might not be all flowey and pretty, But I'm going to get that fish. For me, it was well worth the effort, especially when there was still a healthy population of species other than Rainbows. Those two creeks are about the only thing I really miss about California. Well, those, and maybe the Mammoth/June Lake Loop. Being on top of Devils' Post Pile at 7am on a mid June morning is almost magical...And we get to catch trout as well? That's when I know this world IS a good place.